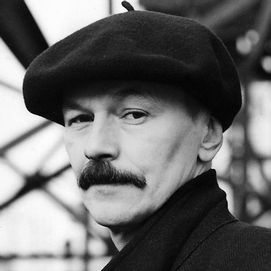 Vladimir Shinkarev was born in Leningrad in 1954. He graduated from the Leningrad State University. With his book Mitki, the artist founded and became the spiritual leader of “Mitki,” the Saint Petersburg artists’ group. Between 1970-1990 Vladimir Shinkarev’s works were displayed at numerous personal and group exhibitions in Saint Petersburg, Moscow, Rio de Janeiro, Vienna, Paris, Los-Angeles, New York and Berlin. In 1997-199_ Mr. Shinkarev created a series of works based on sixteen books, some famous, some barely known (“World Literature”). In 2001-2006 Shinkarev worked on a “World cinema” project, dedicated both to the history of the cinema and to the 20th century history itself. Vladimir Shinkarev is also the author of a number of books, including the legendary “Maksim and Fedor,” one of the foundational texts of Mitki movement. His works can be found in the Tretyakov Gallery in Moscow, the Russian Museum in Saint Petersburg, the Hermitage, the Saint Petersburg history museum, the Victoria and Albert Museum in London and others. Vladimir Shinkarev is a laureate of the Art Awards prize (best artist of Saint Petersburg) 2007.